Airports are a study in contrast. Some people are puffing and sweating as they run with luggage, while others are charging their devices and settling in to sleep, as if they lived there. What makes the difference? It all depends on when you believe your plane is leaving. This issue of the magazine deals exclusively with the second coming of Christ, which is either a subject to be analyzed and discussed, or an urgent, personal matter for which both believers and unbelievers must prepare. While there are over 300 prophecies about the first coming of the Lord Jesus in the Bible, there are over 1800 prophecies related to his second coming. The first book, Genesis, tells of Enoch who “prophesied … saying, Behold, the Lord cometh with ten thousands of His saints” (Jude 14). Revelation, the last book, ends with the Lord Jesus saying six times, “I come” (Rev 2:25; 3:11; 16:25; 22:7, 12, 20). Cover to cover, it is a central theme that runs throughout Scripture. 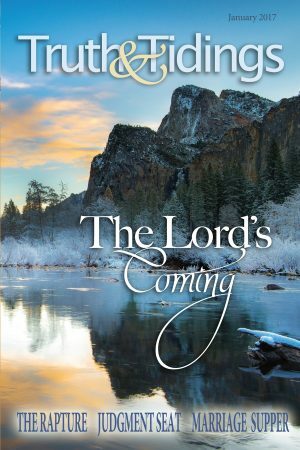 The coming of the Lord is one of the most assured events in the Bible. Ancient Job declared, “I know that my Redeemer liveth, and that He shall stand at the latter day upon the earth” (Job 19:25). Every writer in the New Testament speaks of His coming, including John, the last disciple, who wrote, “Behold, He cometh with clouds; and every eye shall see Him” (Rev 1:7). Even angels speak of it without any doubt. The two at His ascension said, “This same Jesus … shall so come in like manner as ye have seen Him go into heaven” (Acts 1:11). At creation, God was anticipating the future in a figure when, after He made the woman, “the Lord God … brought her unto the man” (Gen 2:22). He was looking forward to the Rapture when He would bring the Church to His Son to be His bride forever. The Lord Jesus referred more than 20 times in all four gospels to His future coming and He always said, “When the Son of Man cometh,” (Luke 18:8) not, “if the Son of Man cometh.” He clearly promised, “I will come again” (John 14:3) and His last words in Scripture are, ‘’Surely I come quickly” (Rev 22:20). The second coming of Christ includes His coming to the air to rapture His Church (1Thes 4:16-17) and His coming to reign on earth (Matt 25:41). This great truth will be explored and expounded in this issue as it is presented in Biblical prophecies, pictures, promises, and parables. The Lord warned on this subject, “Take heed that no man deceive you” (Matt 24:4). He anticipated fraudulent imitation and flawed instruction on this vital truth. So, may God use this teaching to educate our minds correctly and touch our hearts completely. The two most common words associated with his coming are “watch” and “ready.” As we begin a new year, each of us should ask, “Am I ready and happy to leave?” Brothers and sisters, this could be the year: our takeoff could be any time now. May God change us so we can truly say like John, “Even so, come, Lord Jesus” (Rev 22:20).